Body Count | News and Features | Style Weekly - Richmond, VA local news, arts, and events. After a rash of slayings in Hillside Court early last year, Police Chief Bryan Norwood led a healing session with residents and officials. Alicia Rasin is unmoved. Sitting just beyond the firing line of television cameras at City Hall last week, the longtime activist doesn't stand up for the procession of white shirts — the police chief, commonwealth's attorney, the mayor and his senior staffers. Richmond's deadliest month in more than six years — since January 2006, marked by the brutal Harvey family murders on New Year's Day — September brought 11 killings that have stirred up some old ghosts. Raisin, donning her trademark sunglasses and long, curling fingernails, consoles Richmond in times of violence. She's led countless candlelight vigils for the families of victims in the city's grittiest neighborhoods. She was here in the bad old days, when 11 homicides a month were typical and the annual body count was always in the 100s, when crack-cocaine-induced drug wars ripped this city apart. So forgive her if she isn't interested in pleasantries. "Tired," she tells a reporter. "I'm tired." It's been awhile. Richmond's notorious reputation as the murder capital of the South faded after community policing was introduced, along with sophisticated data-mining software and hard-hitting federal gun laws. The crack-cocaine epidemic isn't what it used to be. But it's still there, just below the surface, that persistent fear that the killings could come back and poison all the progress — the residential renaissance, the youthful infusion of artists, hipsters and professionals rediscovering an old, cobblestoned city. Richmond had 161 killings in 1994, at the height of the drug wars, and for 10 years hovered above 100 — until 1998. The annual murder rate remained stuck in the 80s and 90s until 2007, when something dramatic happened: They dropped to 55. The next year, in 2008, homicides dropped to 32, the lowest total in more than three decades. Last year Richmond recorded just 37 killings. "Between 1992 and 1999, 11 was our everyday month," recalls David Hicks, senior policy adviser to Mayor Dwight Jones and Richmond commonwealth's attorney from 1992 to 2004. "We had more numerical homicides than north Jersey. This place was insane." It's a bit premature to run for the suburbs. Despite the recent spike, overall violent crime is down 4 percent on the year, Jones says, and drugs don't appear to be fueling the recent bloody spell. Much of the 1990s violence was a product of the crack epidemic, which dramatically changed the inner-city drug market. Crack was easy to make and cheap, and it meant that anyone with a couple grand could become a dealer. The well-structured, sophisticated drug gangs that moved kilos of cocaine in the 1980s were slowly replaced by lower-level dealers, defense lawyer David Baugh says, and law enforcement struggled to keep up. "Back when we had heroin and cocaine, there was a lot more structure," Baugh recalls. "Then we had crack. Anybody could get involved in selling." With help from federal law enforcement, Richmond police got better at breaking up the well-networked drug gangs, but that often led to deadly turf wars. When one supplier was locked up, others jockeyed to fill the demand. And they did so with AK-47s and street sweepers, automatic weapons with 50-round magazines. "When you kill off all the predators, the rabbits go crazy," says Baugh, who doesn't see any turf wars in the recent spate of killings. "All murders come down to passion, greed and crazy. Now it's just passion." There is no evidence that this year's string of violence is connected to an increase in drug-related gang activity, Richmond Commonwealth's Attorney Mike Herring says. "We aren't seeing a correlation between high-level drug activity and the killings," Herring says at last week's news conference. "There are instances of both accomplished and attempted robbery. And then there are some instances of people arguing over drug debt or drugs and the event escalating into a shooting. What we aren't seeing though is enough of a correlation for us to get ahead of it, predict a pattern and intercept it before it happens." Still, the bodies are piling up. As of press time Monday, Richmond has seen 36 homicides for the year, which practically guarantees the city will end the year with more homicides than in 2011. With more than two months to go, it could be significantly more, which likely will have political ramifications. There's a reason the mayor summoned the television cameras last week. It's no secret that Jones has a chilly relationship with Richmond Police Chief Bryan Norwood, who was hired by former Mayor Doug Wilder in 2008. Norwood isn't a political animal, sources say, and doesn't beat a path to City Hall. Norwood also is less vocal and nowhere near as politically visible as his more charismatic predecessor, Rodney Monroe, who oversaw the city's dramatic decline in violent crime from 2005 to 2008, before leaving to take over the Charlotte-Mecklenburg Police Department in North Carolina. Last week, Jones didn't exactly give Norwood a ringing endorsement when asked if he still supported the police chief. His response was firm and terse: "Our police are doing a great job and the chief is leading the police department." There are rumblings of discontent. Norwood says the department is reaching out to state and federal law enforcement to address the spike in homicides. But that leads to another question: Did it ever stop? Jerry Oliver, Richmond's police chief from 1995 to 2002, says part of the problem is Norwood isn't reaching out enough. Now a law enforcement consultant in Phoenix, Ariz., Oliver gained notoriety in the late '90s for helping create Project Exile after working with local and state prosecutors and federal law enforcement. Felons convicted of possession of an illegal gun got a minimum of five years in federal prison. On Oliver's watch, the drug killings fell dramatically. Oliver faults the police chief for letting crime-prevention programs that drew together disparate organizations — the city departments such as social services and the school system, as well as religious and community leaders — fall by the wayside. "I have talked to people who live there," says Oliver, 65. "They say his profile is fairly low, he's seldom seen, he's not really in the community and he's not a cheerleader. That could be part of the problem." The police chief's visibility is critical, Oliver says. 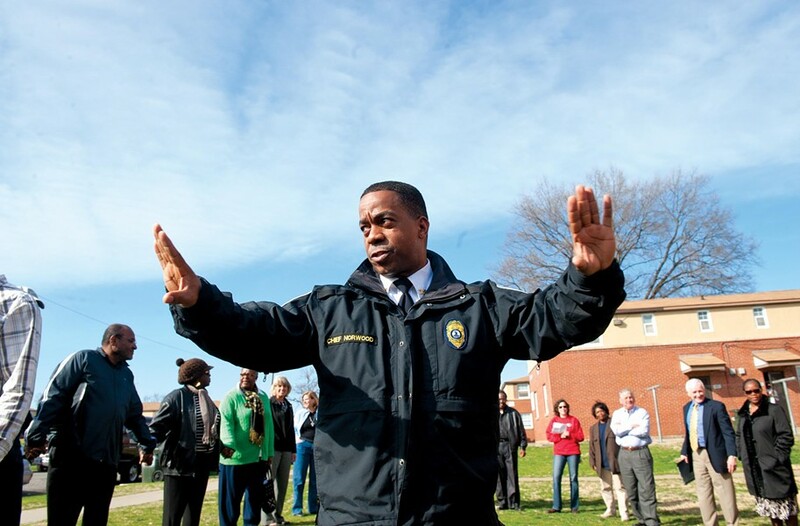 "I'd say that the police chief is one of the most important leaders in the community. He or she has to be the person that rallies the troops," he says. "You can't do it laissez-faire and you can't do it with kneepads on. You've got to be bold and you've got to be innovative and out there among the folks." James Mercante, a police spokesman, dismisses the criticism. "If anything, under Norwood the partnerships have been increased and strengthened," Mercante says. Norwood may well be taking too much of the blame. After all, even his predecessor predicted that at some point the homicide rate would rise again. Richmond's poverty rate continues to worsen — it stands at 25 percent of the city's population — and the local economy isn't exactly improving. It isn't by happenstance that the September killings "occurred in a geographical area that closely aligns itself with the poverty in our city," Jones says. And even if the bad days return, there are far more resources to deal with them, says Deputy Commonwealth's Attorney Learned Barry, who was one of two homicide prosecutors back in the 1990s. "Now, we've got seven" prosecutors who work murders, he says. "I used to have eight homicide detectives, now I have 24.